Costs showing up as 'not set'? See the details. 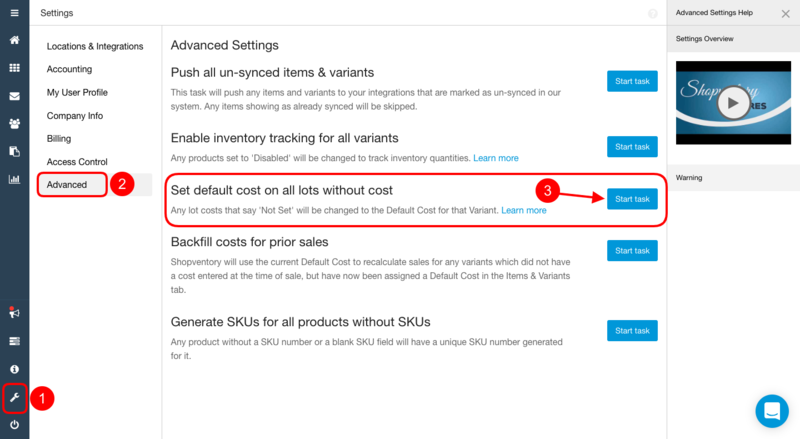 If you're seeing costs as "not set" on SALES REPORTS, you can simply backfill those lots using the current Default Cost. Inventory costs are calculated using Lot costs. Even if a product has a Default Cost entered, the Lot Cost must be set for accurate calculations in the Reports section of Shopventory. Lot costs cannot be added if there are no quantities in stock. A Product must have a quantity of at least 1 in order to update its lot cost. This task will apply the Default Cost to any Lots that are 'Not Set'. NOTE: In order for this task to apply the Lot Cost, there have to be a quantity of units in that Lot. Any Lot with a quantity of zero or a blank quantity would not be affected. Please start a chat if you have any further questions. We are here to help!